After designing software for physicians to use in dictating patient notes, I helped the client design a microphone. It had buttons for controlling the recording, for dealing with the speech-to-text conversion, and for controlling the mouse pointer. This made it the only device the user needed to use with the dictation software. We did several rounds of refinement and usability testing. Late in the project, we took a non-working model to a radiology lab, where radiologists studied actual MRI images. We asked them to hold the new microphone as if they were really using it, and tell us how it felt in their hands, how they liked the buttons and how it compared with the mic they currently used. 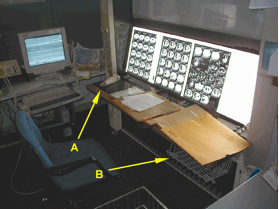 This photo shows a radiology work area. The item marked “A” is actually a sandwich, but it’s where one physician put the microphone down. He was engrossed in the MRI image, but was reasonably careful with the mic. Location “B” is a basket for papers that another physician used as a storage place for the microphone. Microphone holder or fruit bowl? We had been thinking about designing a holder for the microphone, something to stick on the side of a monitor. I realized that the radiologists weren’t as careful about the device as we expected they would be. Not that they were careless, but they were so much more focused on the images they were reading. Half-jokingly, I suggested we use a big fruit bowl with sloping sides as a holder. The mic would slide into the bowl, and it would provide a big target. The client eventually went with a standard holder, but seeing how people actually used the device was eye-opening. It’s different at a hospital than a usability lab. We knew beforehand that this would be a real work situation, but seeing the radiologists reading real MRI images made us realize the seriousness of interrupting them. We modified the study a little to make sure they could concentrate on their work as much as they needed to. We got good results in the study, the microphone went into production and it is still being used, many years later. In fact, I just found that it’s for sale at Amazon.com, with and without the holder. See it at Amazon.com. This entry was posted on Wednesday, September 29th, 2010 at 3:03 pm and is filed under Hardware, Health care, Usability studies. You can follow any responses to this entry through the RSS 2.0 feed. You can leave a response, or trackback from your own site.